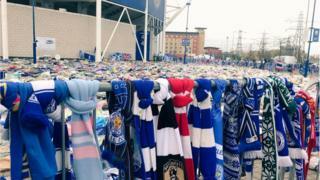 Thousands of Leicester City fans are set to join a memorial walk in honour of those killed in the helicopter crash outside the club’s stadium. Club owner Vichai Srivaddhanaprabha was among five people who died when the aircraft came down on 27 October. The 5,000-1 walk is named after the odds the club overcame to net its “fairytale” 2016 Premier League win. Fans will march from Jubilee Square to the King Power Stadium before the Foxes play Burnley. On Friday, the club announced plans to erect a statue of Mr Vichai at the King Power Stadium. The idea for the memorial walk came from young supporters Megan Elliott, 14, and her sister Casey, 11, who initially appealed for 5,000 fans to march to the stadium in honour of the Thai billionaire and chairman. However, about 20,000 people are expected to join the parade, which Megan said “means a lot”. Casey said Mr Vichai had “done lots for Leicester” and was “the best chairman ever”. Leicester City Council said the walk will leave Jubilee Square at 12:45 GMT and follow a route towards De Montfort University campus and along the riverside to the King Power Stadium. The authority said it was expecting a “large number of people” and road closures would be in place along the route. Tributes left outside the stadium following the crash were moved to a designated memorial area close to the accident site on Friday. Leicester’s players will wear special shirts with their former owner’s name embroidered on them for the game, and a tribute video will be shown before kick-off. Fans will be given commemorative scarves, pin badges, clappers and programmes in honour of Mr Vichai. The club said a two-minute silence would be observed prior to the game in memory of servicemen and women, as well as the five who died in the crash. An inquest, opened on Tuesday, heard there was “minimal chance” for anyone on board the helicopter to survive the crash. Players and staff attended the start of Mr Vichai’s seven-day funeral in Thailand earlier in the week. Two members of Mr Vichai’s staff – Kaveporn Punpare and Nusara Suknamai – as well as pilots and partners Eric Swaffer and Izabela Roza Lechowicz were also killed in the crash. Police have said Ms Lechowicz was a passenger at the time of the crash. The Air Accidents Investigation Branch is investigating the cause.